Laryngeal pathologies due to cigarette smoking vary among individuals, whereas some smokers remain disease free. These differences can be explained by multiple factors among individuals. In this context, an animal study was designed to determine if there is any protective effect of aerobic exercise against the detrimental effects of cigarette smoke on laryngeal tissues. A total of 24 male Wistar albino rats were divided into three groups of eight animals each: control (no smoke exposure), smoking (smoke exposure), and exercise (smoke exposure and exercise) groups. Histopathological (light and electron microscopy) and immunohistochemical (GSTA1, CYP1A1, CYP2E1) evaluations of the vocal folds were performed at the end of experimental period. Exercise group revealed statistically significant decrease in edema (p = 0.03) and inflammatory cell infiltration (p = 0.02) compared to smoking group. In electron microscopic evaluation; cytoplasmic vacuoles were also present in exercise group, but were smaller than smoking group. Edema and swollen mitochondria were also less prominent in exercise group. Condensed chromatin material in the periphery of nucleus was observed only in few cells in exercise group, and observed in more cells in smoking group. GSTA1 expression was higher (p = 0.047) and CYP1A1 expression was lower (p = 0.01) in exercise group than smoking group. Our results indicate that aerobic exercise has a protective role on the larynx against the damaging effect of cigarette smoke. Smokers who exercise regularly may be at a lower risk of cigarette smoke-related laryngeal diseases, as compared with those who do not exercise. 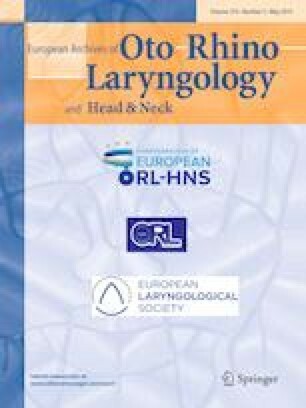 Oral presentation of this study was perfomed at 39th Turkish National Congress of Otorhinolaryngology and Head and Neck Surgery, 8–12 November 2017, Antalya/Turkey. The authors declared no conflict of interest and received no financial support for the study.